Outback Contractors, Inc. can furnish and install MegaDeck Matting for all your construction needs including access roads, crane and bucket truck pads, and pull site and landing zone pads. Outback Contractors, Inc. can supply matting for the smallest jobs to the largest transmission reconductoring jobs. 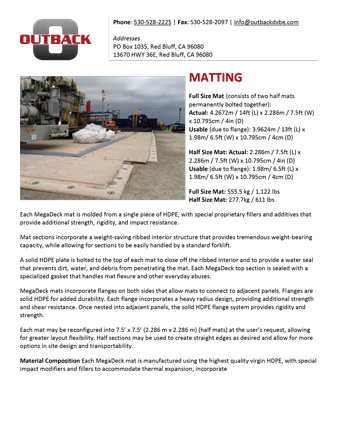 Temporary matting can be used to enable you to access your job sites in wet and muddy conditions to allow you to complete your construction projects in a timely manner. 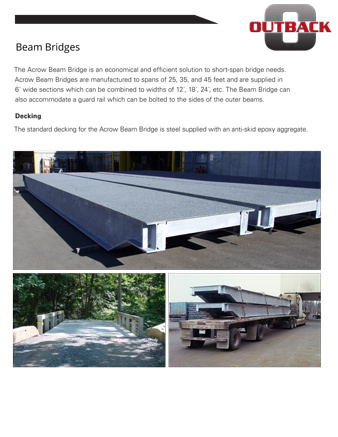 Outback Contractors, Inc. is pleased to offer Accrow Beam Bridges for your access needs. Outback Contractors, Inc. can furnish and install the Bridges with ease and quick installation. The Bridge is an economical and efficient solution to your short-span bridge needs. Manufactured to spans of 25, 35, and 45 feet and are supplied in 6´ wide sections which can be combined to widths of 12´, 18´, 24´, etc. For more information and specifications please see the PDF’s.